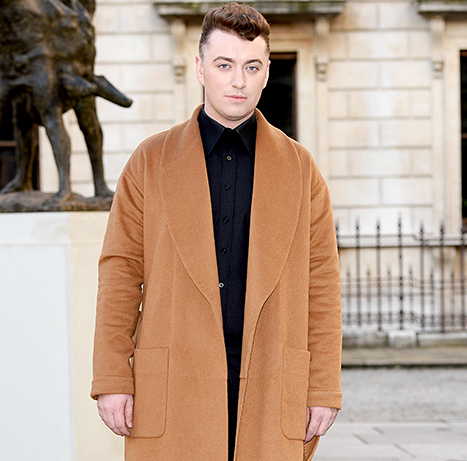 Sam Smith Looks Skinnier Than Ever: See His Weight Loss Transformation! Slimmed-down Sam! Grammy winner Sam Smith hit a red carpet for the NRJ Music Tour in Lille, France on Tuesday, March 31, and looked noticeably different after losing some serious weight. The "Stay With Me" singer, 22, revealed last month that he dropped 14 pounds in two weeks, thanks to a new diet. Smith&apos;s new figure was fully visible in a slim-fit brown trench over a white collared shirt. Sporting a bit of scruff, the singer&apos;s face is less full as well. "Three weeks ago I met a woman who has completely changed my life," Smith wrote on Instagram on March 17. "Amelia Freer has helped me lose over a stone in 2 weeks and has completely transformed my relationship with food. Everyone go check out her incredible book, and start to live healthy. It&apos;s not even about weight loss it&apos;s about feeling happy in yourself. Love you Amelia & thank you for making me feel so happy inside and out @ameliafreer #eatnourishglow." Smith has gone on to share photos of himself getting fit in the gym, and the healthier meals he is choosing. British nutritionist Freer recently spoke to Good Morning America about her work with Smith, saying her focus is on a lifestyle of healthy eating that cuts out sugar and processed food. "For me the key is about it being real," she told GMA. "Getting back in the kitchen, cooking from scratch, making sure they are not relying on junk processed convenience food."